Good grief, look at what the GOP is up to now, reading the Constitution aloud, into the Congressional Record. There is a darn good reason why that hasn't been done, before now, in America's 224 year history - a sense of sanity from the Republican Party. Those days of sanity are over, replaced, by a return to "states rights" insanity. If Conservatives want to bring back Jefferson Davis, as their hero, I say, go for it! Good luck with that tactic, GOP. This reading of the Constitution, into the Congressional Record, is smoke and mirrors, nothing more. It is amazing to me, considering that the Democratic Party already has a video record of John Boehner totally blowing a reference to the Preamble of the Constitution, while reciting from the Declaration of Independence, that Boehner would consider doing this reading himself. Dollars to doughnuts says that Boehner selects another "reader", so that the media can't splice-and-dice his Constitutional blunder with sound bites from this reading. When Boehner made his blooper, following the 2010 midterm elections, he was even waving around a pocket version of the Constitution. What possible excuse could a Minorty Leader of the House render, that would explain that level of apparent ignorance about America's founding documents? I don't think that Mr. Boehner has the cajones to do this upcoming reading himself, but I'd be pleased as punch if he proves me wrong. With the CSPAN cameras rolling, the media would be in sound-bite-splicing-heaven, for eons. Actually, I think Boehner's problem with the founding documents, is genetic. Here's my theory, and I'm sticking to it. There's a gene, that makes people gravitate towards conservatism. And, that same gene, causes a "dyslexic", wackadoo perception of the Constitution, in relation to, the Declaration of Independence. Here's my proof: Rush Limbaugh. Mr. Limbaugh was at the 2009 Conservative Political Action Conference (CPAC), to deliver the keynote address and to accept their 2009 award for "Defender of the Constitution". "We want every American to be the best he or she chooses to be. We recognize that we are all individuals. We love and revere our founding documents, the Constitution and the Declaration of Independence. We believe that the preamble to the Constitution contains an inarguable truth that we are all endowed by our creator with certain inalienable rights, among them life. Liberty, Freedom. And the pursuit of happiness. Those of you watching at home may wonder why this is being applauded. We conservatives think all three are under assault. Thank you. Thank you." See? It's in their genes. Boehner had to have seen Limbaugh make that blunder, it was all over the media for weeks. You would think, that after seeing Limbaugh hand the media that blooper, Boehner would have boehnered up on his Founding Fathers' documents. Here's what I think the Democratic response should be to this stage play by the Grand Old Party. Total respect. No snickering. No nodding off. Applaud in the proper places, if allowed. A standing ovation for the Preamble would be appropriate, if allowed. Be prepared for the reader to accentuate the clauses that support the agenda of the Republican party, while glossing over clauses like: "promote the general Welfare", "three fifths of all other Persons", "To make all Laws which shall be necessary and proper for carrying into Execution the foregoing Powers", "under the Authority of the United States, shall be the supreme Law of the Land; and the Judges in every State shall be bound thereby, any Thing in the Constitution or Laws of any State to the Contrary notwithstanding", and "Congress shall make no law respecting an establishment of religion". Here are a few of the clauses/phrases that I see the Constitution reader accentuating, in search of cheers: "provide for the common defence", "Blessings of Liberty to ourselves and our Posterity" (with a heavy, heavy accentuation of "Blessings"), "Done in Convention by the Unanimous Consent of the States present the Seventeenth Day of September in the Year of our Lord", "Amendment 10 - The powers not delegated to the United States by the Constitution, nor prohibited by it to the States, are reserved to the States respectively, or to the people". I'm going to guess that he, or she, the Constitution reader, will be practically shouting the portions that I have bolded. Here's what Minority Leader, Nancy Pelosi, should do after the reading concludes. Make a request to clarify the reading of the Constitution, with the reading of the following documents: From the Federalist Papers, Federalist #33, by Alexander Hamilton, and Federalist #39, by James Madison. Those, will get their heads spinning with NATIONAL supremacy. Also, from the Founders' Constitution: James Madison's letter to Thomas Jefferson, dated June 27, 1823; James Madison's letter to Edmund Pendleton, dated October 28, 1787; and James Madison's, Notes on Nullification written between 1835 and 1836. In a concluding statement, Minority Leader, Pelosi, could ask her esteemed Republican colleagues to please read the remaining Federalist Papers on their own, so as to clear up any other misconceptions that they have about what the words of the Founding Fathers, in the Constitution, actually meant. The Repeal Amendment proposed by the Republican party is "anti-Constitutional". You should let your Republican colleagues know that, from day one. They've already got the hint. 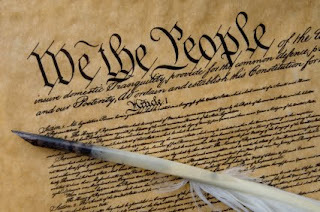 Randy B. Barnett, who teaches constitutional law at the Georgetown University Law Center, wrote an op-ed the other day, in the Washington Examiner, attempting to defend this anti-Constitutional nonsense. Barnett is, reportedly, the wordsmith that crafted the language of this proposed 28th Amendment. First, the Washington Post's Dana Milbank played the race card. "[T]here's the unfortunate echo of nullification -- the right asserted by states to ignore federal laws they found objectionable -- and the 'states' rights' argument that was used to justify slavery and segregation." But this is imaginary. Undermining civil rights is simply not on the agenda of anyone who favors this. Besides, to reach the two-thirds threshold to repeal any law would require the support of lots of blue states as well as red states, from different parts of the country. Fear this amendment not, Mrs. Pelosi. You should look at this proposed amendment to the Constitution for what it is, a bad joke. Crush it with the words of the Constitution, the Federalist Papers (Publius), and the words of the Founding Fathers (The Founders' Constitution).